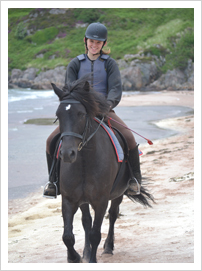 Come and enjoy pony trekking on the beautiful Red Point beaches with breath-taking scenery allround. We have a great selection of well mannered native horses and ponies to suit all ages and abilities. The trekking centre operates to a very high standard with friendly knowledgeable qualified staff. Established in May 2000 the centre has relocated in 2015 only 9 miles away to be able to offer you amazing beach rides. Ride on the Red Point beaches featured in the film "What we did on our holiday" a trek you will remember.